Just 7 years to go! Welcome to Wikimania 2011's official site! Нохчийн: Марша догlийла Викимарзйаларе 2011! Русский: Добро пожаловать на Викиманию 2011! Türkçe: Wikimania 2011'in Resmi Sitesine Hoşgeldiniz! Azərbaycanca: Wikimania 2011'in Rəsmi Saytına Xoş gəlmisiniz! Esperanto: Bonvenon al Vikimanio 2011 ! Bengali: উইকিম্যানিয়া ২০১১তে আপনাকে স্বাগতম ! catalan: Benvingut a Wikimania 2011! Беларуская (тарашкевіца): Вітаем у Вікіманіі 2011! Tajik: Хуш омадед ба Викиманиа 2011! Armenian: Հայերեն: Բարի գալուստ Վիքիմանիա 2011! French: Bienvenue à Wikimania 2011 ! Español: ¡Bienvenido a Wikimania 2011! Italiano: Benvenuti su Wikimania 2011! Magyar: Isten hozott a 2011-es wikimánián! Deutsch: Willkommen auf der Webseite der Wikimania 2011! Nederlands: Welkom op de website over Wikimania 2011! Tiếng Việt: Chào mừng bạn đến website chính thức của Wikimania 2011! Português: Bem-vindo à Wikimania 2011! Tagalog: Maligayang pagdating sa websayt ng Wikimania 2011! Hrvatski: Dobrodošli na Wikimaniju 2011! Українська: Ласкаво просимо до Вікіманії 2011! עברית: ברוכים הבאים לוויקימניה 2011! العربية: مؤتمر ويكيمانيا 2011 يرحب بكم! فارسی: به ویکی‌مانيا 2011 خوش‌آمدید! Wikimania is the annual international conference of the Wikimedia community. It's organized by a different local team each year – in 2011 the conference is taking place in Haifa, Israel. Wikimania allows the community and the general public to learn about and share their experiences with free knowledge initiatives all over the world. The previous conferences were held in Frankfurt, Germany (2005), Boston, USA (2006), Taipei, Taiwan (2007), Alexandria, Egypt (2008), Buenos Aires, Argentina (2009) and Gdańsk, Poland (2010). 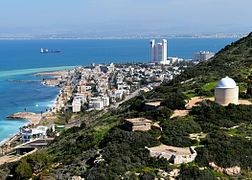 You'll find plenty of information in this wiki about the venue, about Haifa and Israel, about accommodation, scholarships, transportation, visas and tourist attractions. Be sure to read the FAQ. This page was last edited on 2 May 2011, at 12:12.